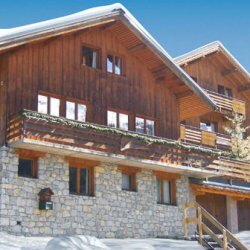 Victoria is an attractive and welcoming chalet, with a light and bright interior and impressive views of the mountains and ski slopes of Roc de Fer in the distance. The living area is our favourite feature of this chalet. 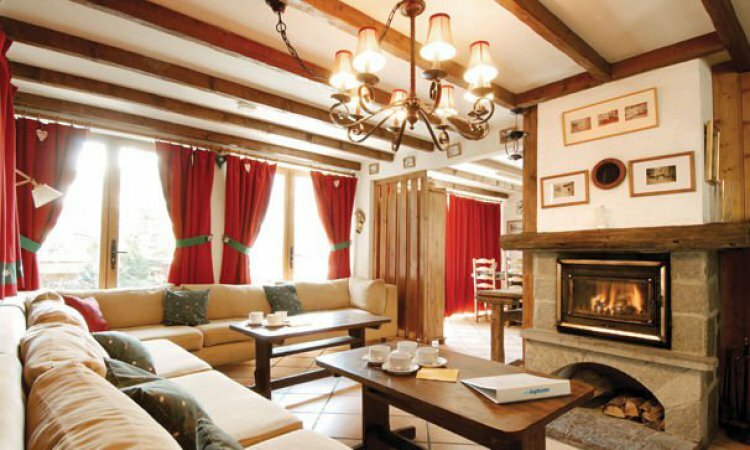 Light, bright and very spacious, it offers spectacular views over the Méribel valley and mountains from its many windows. Settle into the comfy sofas in front of a warming log fire and enjoy our afternoon teas and three course dinners. 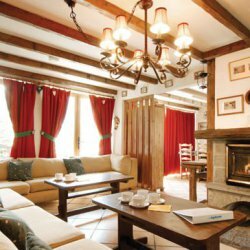 You’ll love the large south-facing terrace and exposed wooden beams which create a wonderfully cosy atmosphere and helps make this chalet one of our favourites! The bedrooms are traditionally furnished and all have an en suite bathroom with toilet. Entrance, ski & boot room, wc. Room 1: Double with bath/wc. Room 2: L shaped' twin with bath/wc. Room 4: Twin with bath/wc. Room 5: Twin with bath/wc, under eaves. Room 6: Twin with bath/wc, under eaves. Room 7: Triple with bath/wc, under eaves. 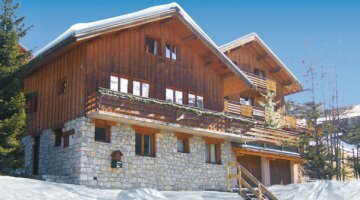 The chalet is located in the Mussillon area of Meribel which is a 10 minute walk to the resort centre. The free ski bus stop passes close by. Nothing beats a freshly-baked cake and afternoon tea when you get back in from the slopes in the afternoon and our delicious three-course meals with unlimited wine until dessert are served 6 nights a week, leaving you free to explore the local restaurants for staff night off. 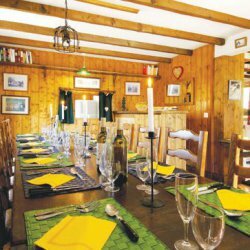 Food is a highlight of any ski holiday, and you chalet hosts will prepare and serve your eveniing meals as described here 5 days per week*. Start your day the right way with a breakfast fit for a (snow) king or queen. We serve a true skier’s breakfast with Full English or other cooked options most days, plus a continental selection that will set you up perfectly for a day on the mountain. You can expect cereals, porridge, preserves, French pastries, (croissants, pain au chocolat), breads, fruit, yoghurt, fruit juices and tea, coffee and hot chocolate. For two mornings we offer a delicious Full English breakfast of bacon, eggs, sausage and beans. On most other mornings tuck into hot options like pancakes, a choice of eggs and other firm favourites like sausages, bacon, beans, and bacon rolls. On a staff day off, a simpler continental breakfast will be laid out for you. Afternoon tea is the traditional ‘welcome home’ for chalet guests at the end of a day’s skiing, with a slice of freshly baked cake, different each day, to accompany your choice of tea or coffee. Served on 5 afternoons. Our 3 course dinner menus comprise of a starter, main course and dessert, accompanied by a choice of complimentary wines, with coffee or tea and chocolates to follow. 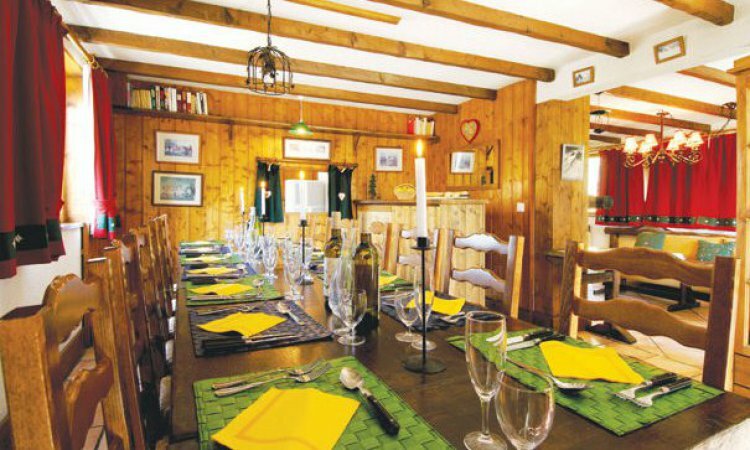 Served on 5 evenings (chalet staff have 2 days off per week). In chalets and chalet hotels with families, you may request an earlier kid's mealtime (on arrival) with our chalet hosts. They’ll do their best to lay on a healthy menu for the under-13s to suit their tastes. We’ll happily provide puréed food for toddlers if you also let us know. We serve tea at around 5.30pm, and children don’t join dinner later that evening so that grown-ups can enjoy an hour or two of child-free time.